I don’t know about you, but chocolate chip cookie dough is one of my most favorite things ever. It never gets old. I make chocolate chip cookies all the time and always eat my fair share of dough. I just can’t help myself! So when I wanted to make a batch of cupcakes, this was a no brainer. I made them blue as a nod to Cookie Monster, but that’s totally optional. Fluffy and moist vanilla cupcakes stuffed with cookie dough, topped with vanilla cream cheese or fudge frosting, and to top it all of a mini chocolate chip cookie. First mix up a batch of your favorite cookie dough (or use store bought – I like Pillsbury) roll into 24 1″ balls and freeze for at least 1 hour before using. The cookie dough will not have enough time to bake if they are frozen all the way through – that’s what you want! 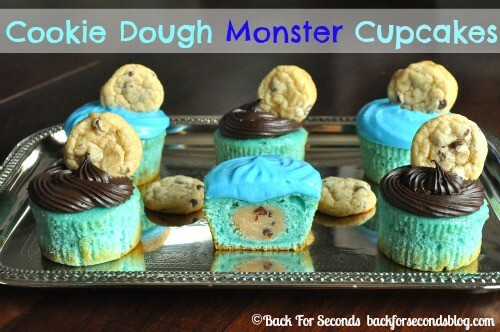 Use the remaining cookie dough to make mini cookies to use as toppers to the cupcakes. In large bowl beat together sugar, butter, and oil until very light and fluffy. Add in vanilla and eggs one at a time. With mixer on low slowly add in flour, milk and baking powder, then turn to high and mix for 2 minutes. 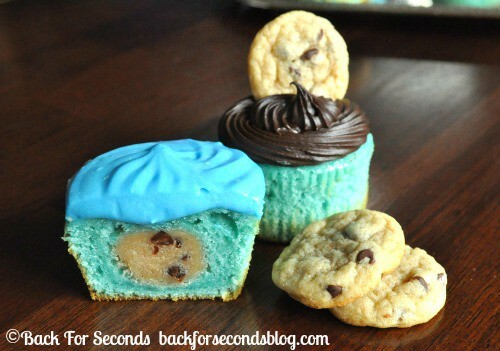 Pour evenly into 24 cupcake liners and drop a ball of cookie dough in the center of each one – do NOT press down. Bake at 350* for about 15-18 minutes or until done. Cool on wire rack and frost. Store in the refrigerator. Let cupcakes come to room temp before serving. Melt butter and chocolate together and let cool slightly. Add sugar, vanilla, and a splash of milk and beat together. Turn mixer on high and slowly add more milk until it reaches desired consistency.